Alien Space War Game - Sign up! Welcome to the Alien Space War Game (ASWG)! This is a new forum RPG for four players (per round). This is a game that I've been playing on pen and paper in classes with friends for a while, and I wanted to see how well it'd transfer to here in the tubes. The game is very, very simple. Yeah, don't expect anything more detailed than that. If you ask very nicely, I might add a THIRD colour in! Anyway, yes, you play one of those four. 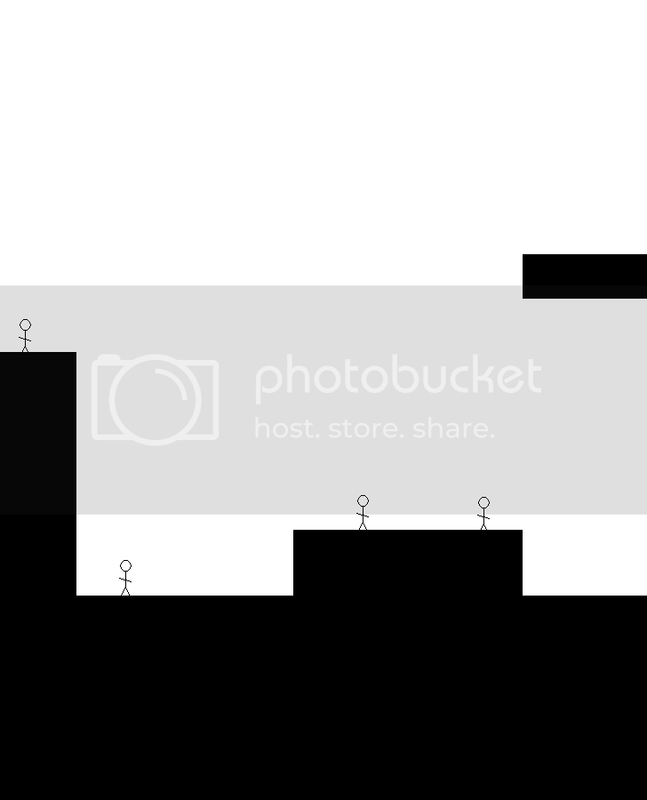 You will be able to give your character a specific item of clothing, so we can tell which Generic Stickman corresponds to which player. So, you're in this world, walking along, and BOOM! Two alien spaceships appear! I'm hoping that these pictures are bad enough to count as "charming". I doubt it somehow. 1) When you begin, you will have no items, 100 HP, and a spade. The spade can be used to dig through the black spaces on the map, as though it were mere soil! In here, you may find items which will help toward the destruction of the aliens. I've written up a huge list of every single item available, and will be randomly picking from them. The further you dig, the more chance you have of finding something. You must however remember that the laws of physics do apply, and any towers that you've dug into are likely to fall over, if gravity demands it. Make sure that doesn't fall on you or one of your team. 2) You can carry up to three items at any time - the spade doesn't count as an item. 3) Each team mate will take it in turns to play, with the order being randomised before the game starts. What constitutes a turn? Well, you can walk about halfway across the map (so to get from one side of the map to the other would take two turns), you can dig to about the same length, and you can climb buildings. Those would be Movement Actions. Alternatively, you can do an Active Action, like using an item, attack someone, or basically anything else! As long as it would take a not unreasonable amount of time, there aren't many limits to what you can do. 4) You don't have to work with your team mates. You can, if you want, betray them, kill them, and steal their items. However, remember that without the proper equipment, you can't kill people. You can punch them if you want, but it won't be fatal, and they might get a little annoyed at you and use their guns that they picked up in their last turn to shoot you. There'll be no penalty for a retaliation. 5) The game will not only take place in this map. Dimensional Portals may open up from time to time, for you to jump into. Just keep in mind that only one person can jump into. 6) You aren't a superhero. You see how big that stickman is? Now imagine how far upward you can jump in real life. Work out how high the stickman can jump. That said, the Dimensional Portals are different, and have a selective gravitational pull. You can jump into them from anywhere, as long as there's no wall in the way. 7) If you do try a clearly impossible feat, I (as the game master) will not say "You can't do that, have another go". I will make your character try to do it. Therefore, if you try and jump across a huge gap, you might end up in a pit. In ambiguous decisions, I'll flip a coin to see what happens. 8) Every four turns (that is, every time each player has had an equal number of goes), one of the alien ships will shoot a ray gun zappy thing to try and kill you. The gun will take away 50 of your health, so be careful it doesn't hit you twice, or you're dead. 9) If you're dead, you're dead. All your items will be dropped where you died, and you can't have any more turns. 10) Don't expect to destroy both ships in a few turns. Whilst I do have a plan/story for you to use to destroy them, it won't be obvious at first, and you'll have to work it out yourself. 11) When the game does eventually end, players will be given a score based on how well they did in-game. Contributing to the cause, being helpful, and making the final moves to destroying the ships will earn you points. Killing people will lose you points. You won't know your points until the end, though. Riight, I think that's all. I'm sure I've missed something, so if you have a question, do ask. Also, sign up! You don't need to give me a character background,a personality etc etc, because it is just YOU. All you need to give me is an item of clothing or accessory (that I'll be able to draw) to put on your stickman to differentiate him. Top hats, shoes, that sort of thing. Don't have the same thing as anyone else, though. Go go go!